In her blog, Noyaux, Shalini Roy tells of her mom making the kebabs in Ottawa for a Canada Day celebration. We thought the recipe sounded so good that we’re bringing it south…and won’t be surprised if it finds its way to a July 4th celebration in the States! Soak 8 wooden skewers in water for 30 minutes. Combine all the ingredients in a large bowl, cover with plastic wrap and chill for 30 minutes. 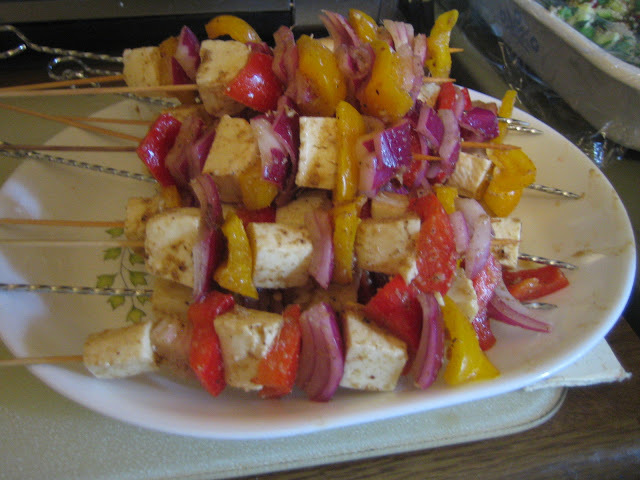 Thread the paneer cubes, onion and peppers onto the skewers. Grill over medium-high heat for about 8-10 minutes, turning every few minutes, until golden.